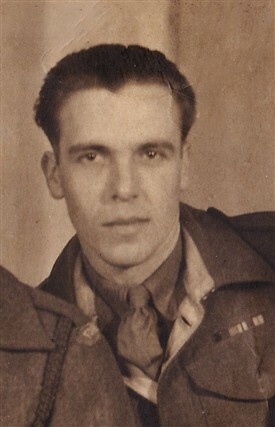 This story is about some of John (Jack) Robinson’s life and experiences during WW2 whilst serving in the Sherwood Foresters. Uncle Jack as he is known to our family is my wife’s uncle. He said that he was born (and he thinks with the rest of his siblings) in Hyson Green, Nottingham, at number 5 Broughton Place, off Holland Street. 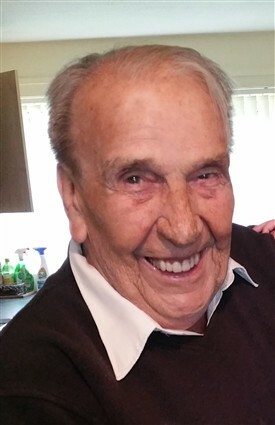 He was called up in Jan 1942 to join the British army during the Second World War and served in the Sherwood Foresters. He, like all soldiers, remembered his pay book number of 4987128. The battalions he served in were the 1st, 8th, and the 2/5th at various times. It was not until the day that Pat and I were married that I heard part of a conversation that was amazing to me. It transpired that my uncle John and my wife’s uncle Jack were both in the Sherwood Foresters. Over time I discovered that they were taken prisoner during the same operation in Algeria, North Africa. Jack’s regiment was involved in a very big WW2 project called operation “Torch”, they both travelled on a troop ship called the “Derbyshire”. He said that they set sail December 1942 to the Algiers, then up the line to Sejenane on the Tunisian border. Basically this was an amphibious attack on the coast to the rear of Rommel’s Africa corp, which was under threat from the east by General Montgomery’s famous 8th army. Unfortunately, it all went a bit pear-shaped (as they say) and he was taken prisoner on the 23/ 3/ 1943...... when you could say a bit of an adventure began. Upon his capture, he was to be involved, as most prisoners were in a long, long journey to various prison camps. He left Algeria and was taken to several countries during his migration to Germany being passed from camp to camp. He refers to this as the grand tour! The route was to go to Sicily (camp 98) through Italy (camp 53) and on to Germany (camp IVB) finally ending up in Czechoslovakia (Brx- Toeplitz) working camp. The various duties that he was expected to do involved mining, steel erecting, working as a navvy laying concrete and railway track. The latter required a large amount of ballast type material to be moved and he a drove a small diesel engine train with small tipping trucks. He also did what I think must have been similar work to my Uncle John in as much he had to clear up bomb damage. At the end of hostilities on 8th May 1945, he with others were told to stay put until collected, but the big problem was that the food ran out! The guards had left, so they decided to find our troops. But everyone was trying to go west towards the Allied lines and most importantly away from the Russian army. He heard that the Yanks (Americans) were at a place called Chemnitz in Germany. To achieve this, Uncle jack had to walk many miles through the Hartz Mountains. He and about 6 others had to walk for about 4 days and nights. One of the problems they had to do was to scrounge food and provisions from houses and farms that they passed en route. I think this is a euphemism for breaking and entering because when hungry, you do not behave well. After this very hard part of the journey he and the rest of the group reached a town where there was a train station. He said that a train came in and it was to be the last train from that station that was going west towards the American lines. Apparently it was a very bad experience due to the fighting to get on and they had to throw people off to get a place for themselves. Eventually he got to the Americans. There was a camp near to the border surrounded by a large barb wire fence. The gate was closed and blocked by thousands of people trying to get to the west. Again he and his mates had to push their way to the front. After a lot of shouting, they managed to attract one of the guards and explained they were British soldiers. He called out the guard to open the gate who fixed bayonets to push back the crowd. This was to open up a passage way for them to get inside the camp. As stated earlier this was the camp at Chemnitz, Germany. When he was taken in by Americans they appeared to have everything and he was asked what he would like to eat. He asked for 2 eggs and they were served on a tin plate. He said he could not eat both of them. This was due to going for so long without food, his stomach had shrunk. He said he just sat there and cried. Uncle Jack said that during this time some of the partisans thought that they were German soldiers also trying to escape the Russians; as a consequence they shot one of their group. The man concerned was dressed differently to Jack and his companions; he said that it was obvious who they were because they all had a large letter “P” on the back of their jackets, so they were allowed to move on. During his time as a prisoner he was sent to several places to perform various duties where they had no say or choice. One of the ways to ensure that they did what was required was a very simple tool - food. If you did not work then you would go hungry! It was as simple as that. At one point, he said that he along with hundreds of prisoners of different nationalities he was sent to a mine. No idea how to spell it but it was called something like the Brx- Columbus mine. One of the jobs that he did was to dig a channel for some wire to be laid. If one can say this, on a lighter note, at one point he was sent to work on a railway marshalling yard. He said the guard was an old farmer, who was in their equivalent of the home guard, similar to the one back in England. Jack said that they used to sit him in a hut while they went out flogging stuff to the French, Dutch, and Belgian workers. But, he says the best customers were in the brothel (I hope that I can explain this part of his story correctly) - maybe the worst place was probably the market - any way you get the idea. Well at that time you had to be a bit fly to get by and survive. Jack was involved in a little bit of trading. He had ways to get hold of scarce items, such as raisins, coffee, and chocolate and would trade them for things like bread. He said that he did do some trade with the girls! He said that one time he went to the brothel and said it was marvellous what you could for 2 eggs! He later added that another time he went in with a tin of corned beef and came out with a tin of sardines as change! When my wife Pat and I heard that we both burst out with laughter, it’s a funny anecdote from difficult and hard days. Jack eventually made it to the American base along with thousands of other people. Many were referred to as “displaced people”; they were all trying to get to their home, often in other countries. Some people for various reasons did not wish to get caught up with the Russians. After his initial recovery, which involved eating and getting washed and cleaned up, he was sent to be interrogated, this was to identify who you were, etc. This part of his story is a very rare occurrence indeed. Like all prisoners of war he would be told to complete a basic form. This form obviously contained required questions, such as name, rank and number and what regiment you were in and place of capture. It also asked for other information such as where you were taken to as a prisoner and whether you suffered any ill treatment. Believe it or not, these records were all hand written and should still be in storage and available to view. Jacks may be in amongst them. That will be a separate project. The other soldier looked at it for a moment and replied “looks fine”. The soldier was amazed when he looked at Jack because he was his brother Percy, who was known as Pym to the family. What a coincidence, they had not seen each other for about 3 to 4 years and ended up next to each other in an interrogation camp. They only had a very short time together before they were moved on to England by differing routes. Jack said from there he was flown to Brussels in a Dakota transport plane and then back to England in a RAF Lancaster bomber. He was given 16 weeks leave and put on double rations to build him back up. He was then called up to wait for his “Demob” as it was known (demobilisation) to come through. When the war had finished Jack was to return for a while to serve with the occupying British army. There were a lot of young men still being called up and Jack, despite being quite young himself was considered an old hand, so was put in charge of some of them. He said that he went out with several others drinking somewhere. He got into an argument with another group and a fight broke out. Any way the MP’s came and they spent some time in the local jail. The argument was at a local bar/cafe in Ostend about being overcharged for their refreshments. He, with the other soldiers was transferred to a jail in Ghent. They were up before the officer of the day. Their representative, a sergeant said to them don’t argue about the rights and wrongs, just accept the officers punishment. The officer gave them all a right good dressing down. He then said to them do you accept my punishment? Jack and his mates said yes. They were all given ten days loss of pay, and told to return to their unit. Well, the unit he was in had moved on. So he was given some money and travel warrants to the place where his unit was. Jack said he and his mates were a little bit foot loose and fancy free! So while on the journey, when the train stopped at a station, they got off. They had no idea where, so they went for a look around the town. They had some money and things like chocolate, which they exchanged for some accommodation and a very good night out. They were a little lost so they ended up at the local MP police unit who said what you doing here?” They said that they could not read German and got off at the wrong station. So the Officer in charge gave them some money to survive while he rang around to find where their unit was. They were then packed off with new travel warrants and money to their unit. So they then decide to do it again and got off at the wrong station, trade money, and goods for a good couple of days and night enjoyment. They were picked up by the authorities again and did this several times! Eventually one of the officers twigged and made them stay put. He arranged for a truck to be sent for them and made sure that they arrived at their unit. Jack said it was nice while it lasted! After the war he worked at several companies. One he mentioned was a car hire company called Swan, where he was the garage manager. This was quite a well known company at the time. He also worked for quite a time on security in Radford at the John Player cigarette factory. He is currently living near to Bobbers Mill Bridge in a flat that is not far from his daughter Deborah. He is now well into his nineties. The first photo is from his days whilst serving in the Sherwood Foresters. The second shows him enjoying his retirement at home. This page was added by John Pownall on 24/04/2017. Hi I wondered if you could contact me as I am trying to trace my dads relative who was a John Ernest Robinson born around 1925/9 ISH. He was born around Lincoln and spent some time in Scotland. In answer to your enquiry for help in your search for information about J E Robinson I am sorry to say that I cannot help you. I have asked Uncle Jack and he is not the person in question. I have emailed a distant relative who has connections to the area you stated, but he is not a Robinson or lives in the area. As he said the surname Robinson is quite common and this often makes it difficult to accurately trace ancestors. Sorry that I cannot be of more help to you.